Tree Of Life Flanders tapestry provides a rendition of the Tree of Life which is balanced and beautiful. The tree of life represents the connection between earth and heaven, as the roots of the tree reaches into the earth while its branches reach towards the heavens. The tree itself is a provider of life on earth as the vines curve up the tree and the tree itself is abundant with leaves or various colors from green to brown. This interplay of greens in the tree leaves and scene itself, with the browns and pinks of the leaves and flowers provide beautifully balanced color for the scene. The attention to detail in the leaves themselves are sensational to the eye. 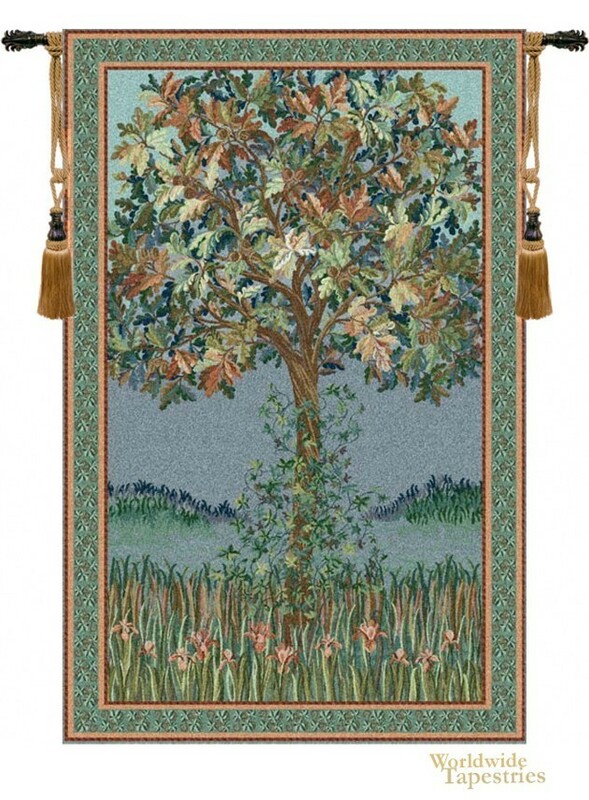 This Belgian tapestry "Tree Of Life Flanders" is backed with a lining, and has a tunnel for easy hanging. Note: tapestry rods and tassels, where pictured, are not included in the price. Dimensions: W 18" x H 32"
Dimensions: W 32" x H 51"